Lots of dads like to grill. They’re usually the ones responsible for the cooking, but this time let him sit back and relax while you prepare drool worthy dishes around the grill. Dads love their meat, so cook him some of some amazing barbecue that are excellent for Father’s Day – show your love for him just through these BBQ recipes that dads will love! Mix together white wine vinegar, dill, lemon juice and lemon zest in a large resealable bag. Add salmon fillets into the bag and shake to coat with marinade. Seal and refrigerate for 30 minutes only (the vinegar will cook the salmon if marinated longer). When prepared, thread salmon pieces onto skewers, alternating with zucchini. Season with salt and pepper then cook on a skillet over medium heat, flipping constantly, until cooked through, about 8 to 10 minutes. Pour half of the contents of this beer can in a container and reserve. Insert the tin in the cavity of the chicken then place the chicken in a large aluminum roaster pan. Cook a pre-heated grill over moderate heat, covered, for 45 minutes. Meanwhile, mix together chilli sauce, molasses, Dijon mustard, lemon juice, hot sauce, chilli powder and liquid sauce in a bowl. When chicken is prepared, baste generously with the sauce mix. Grill chicken for another 45 minutes. Pour remaining sauce in a pan and simmer until reduced in half, about 20 minutes. 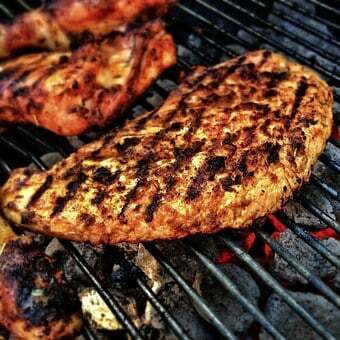 When chicken is ready, remove from the grill and slice. Serve with sauce for dipping. Show your love and appreciation to all the fathers in your life like father, your grandfather, your husband, a friends and other special dads – cook them something that the will never forget – try these Father’s Day barbecue recipes. Keep in mind that it’s the thought that always counts!